Another sublime day on the bike. 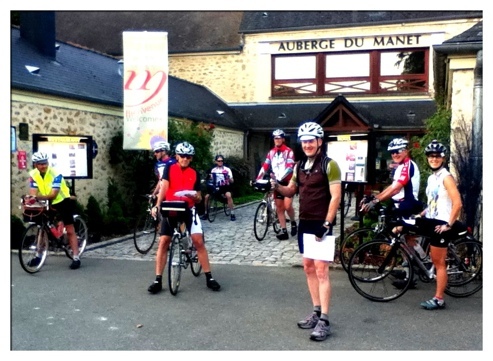 Today Felkerino planned a group ride to Chartres, a 77 mile round trip over gentle rolling terrain. Our outing included randonneurs from D.C, Seattle, New Jersey, Tennessee, and Chicago. 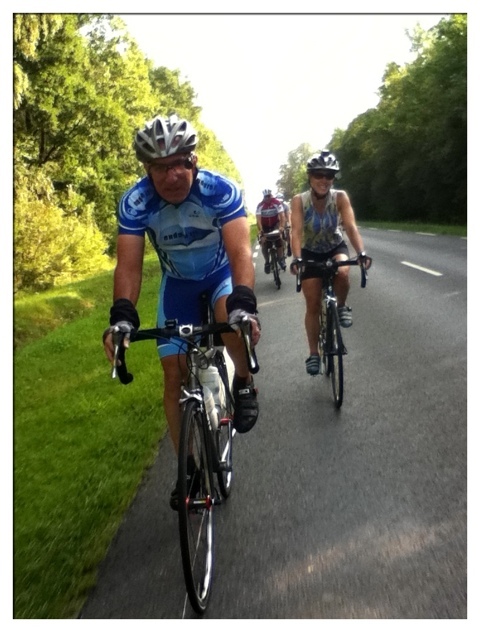 It was another great day to be a bike rider and I am still just over the moon about our lovely ride. We passed through the Rambouillet Forest again, through a couple of other smallish towns including Gallardon and Coltainville. 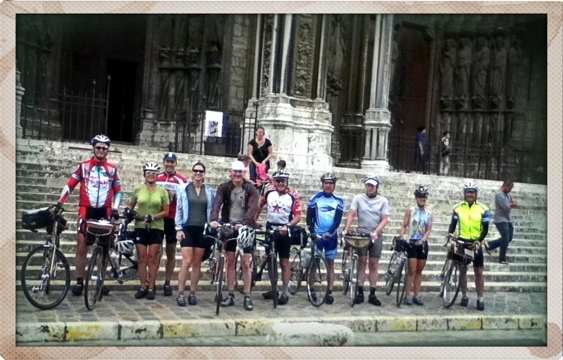 We then followed the spires of the historic Cathedral of Chartres all the way into town. The cathedral sits at the top of a short but kneebreaking steepie, and dates from the 13th century. Stone walls, carvings, and floors, and huge colorful stained glass windows. Gorgeous, albeit a little dark inside. We took in the Malcolm Miller tour, a man who has dedicated his life to studying the cathedral, and his tour was actually interesting and helped me get a better context of the edifice. So we got culture and a perfect mellow ride over quiet back roads. The afternoon threatened rain, but lucky for us, no drops fell. Oh, and did I mention espresso and pastries? Yes, we got those, too. Thus endeth the short leisurely rides. The next time we clip in will be for the start of PBP. And that’s no short ride. Pictures below include the ride start from our hotel, action shots from the road, Michael’s MAP bicycle (eye-poppingly beautiful bike by a custom builder in Oregon), and a group photo in front of the cathedral. Sigh. I love this trip! 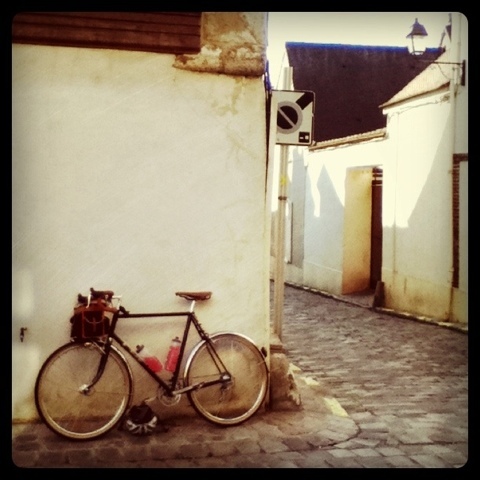 PBP Shakedown ride… To Rambouillet! awesome!! it sounds great! ed surely has mastered the art of the euro blog post!! Welcome to France. I’ll be following your progess on PBP. Have a safe and successful journey!!!! Love the pictures, you captured some timeless images. I hope you two have a terrific time. I will keep looking at your pages to see how you are getting along. Love the pictures, looks like you had fun. I am sorry I missed this ride. I was riding in Paris on that day.